ITV’s Tonight documentary series turned the spotlight on the UK homecare landscape last night - focussing on the funding crisis taking its toll on an undeserving, growing ageing population. The programme entitled ‘Growing Old: Care in crisis’ reflected the harsh reality faced by many older people and the UK homecare companies who provide state-funded care packages on behalf of local authorities. At Home Instead, we don’t bid for these types of block homecare contracts for councils. But we recognise the backdrop of spiralling negative costs that homecare providers that do are facing and the pressure they are under as a result. Cash cuts passed down from successive Governments over the years have left a grim legacy – and it’s our nation’s older people who are inheriting the day-to-day impact. They are experiencing rushed care visits, delivered by care workers who, through no fault of their own, are left feeling undervalued and burnt out - as they try to deliver homecare at the front line against this financially squeezed backdrop. The call to the Government was loud and clear through the programme. These homecare providers can no longer shoulder the burden of further cuts to social care funding AND afford to pay care workers the new National Living Wage, when it comes into effect next year. The funding issue has reached critical point for the homecare sector. Through the programme, all sides of the care sector urged the Government to fund the extra £1 billion needed to cover the cost of the introduction of the National Living Wage. A response from the Government featured in the programme, stated that the costs of providing social care will be considered as part of the spending review later this year. This critical funding message has to hit home with the Government NOW. These homecare providers cannot shoulder the financial burden for another year - let alone another decade. Without this funding, their future is under threat with the reality - thousands of older people could be left without vital homecare services. The knock on effect will hit hospitals that will have to pick up the pieces on an already squeezed NHS in turn. And if there isn’t the money to pay care workers fairly – the crisis will cut even deeper as they move into other sectors such as retail that quite simply can pay better. It’s a frightening domino effect. We set up Home Instead in the UK 10 years ago because we wanted to see homecare delivered with dignity and companionship, homecare that is relationship-led and person focussed - not just about tasks. For us this key combination that equals quality care can’t be delivered in short visits – that’s why Home Instead visits are typically a minimum of one hour. We believe that quality care can only be delivered by people at the front line who feel valued and respected. Our 8,000 CAREGivers are the backbone of our care model, and are recruited for their care and companionship. We couldn’t deliver quality homecare without their commitment and dedication to our mission and we are always looking for more people who have care running through their bones to join us. We match CAREGivers and clients based on common interests, backgrounds and hobbies - this is the very foundation for the delivery of relationship-led care. But it is not right that many people are denied these type of services simply because the local authorities are being forced to put cost ahead of quality. 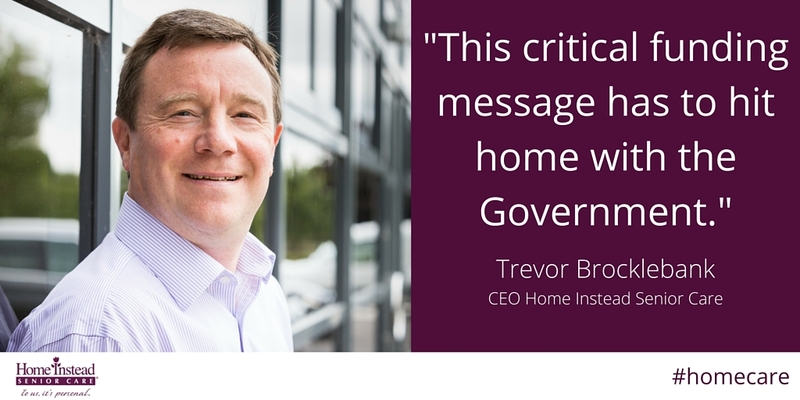 Funding from the Government in the Comprehensive Spending Review will mean a new dawn for homecare. It will save providers across the sector from the market instability they currently face and secure the long-term future of care standards for decades to come. Most importantly it will ensure older people across the UK are treated with the respect and dignity they deserve.